Susie Gibson grew up on the east coast of New Zealand’s North Island, close to the Pacific ocean. After completing a Bachelor of Visual Communication Design at Massey University in Wellington, she worked in commercial design studios for several years before heading to Mexico’s Yucatan Peninsula. 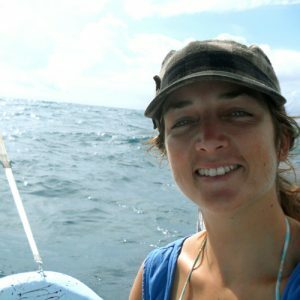 In Mexico, Susie spent 5 months volunteering on a coral reef monitoring project. She also completed her PADI Dive Master. Susie was fascinated daily by the myriad of creatures out on the reef; after learning more about the threats facing the ocean environment and seeing some of these first hand, she decided to focus her design work on projects that would raise awareness for ocean conservation issues. She became involved with the Olive Ridley Project in 2013. She designed the project logo and created educational materials to support the team’s ongoing mission. With a passion for illustration, Susie enjoyed creating the imagery for the Olive Ridley Project’s animation ‘Threats of Ghost Nets’.